View Poll Results: Should JagWaugh be reinstated immediately? We, the undersigned, think JagWaugh, a valued and well-loved member of EF, was wrongly and unfairly banned, and demand that he be reinstated without delay. Perhaps even promoted to moderator. The mod team needs more people who can handle a socket wrench and fewer loose cannons. I’d go with inappropriately banned, rather than innocent. But yeah. He should be unbanned but should not be given a cannon, loose or, er, unloose. Lift the ban and JW for Mod. Is it due to this crazy time of the year when seasons transcend and as a result of the Mods fingers slip on the ban button continually? Is JW a democrat or a republican? Is he for or against Brexit? How well has he integrated? Can he say "Chuchichäschtli? 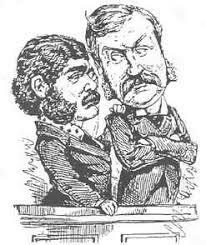 Free the Gilbert & Sullivan One !!!! Difficult to prove innocence. I believe Not Guilty is the right verdict. Perhaps even promoted to moderator. But I look forward so seeing him back soon. Guilty or innocent of what? I believe that freedom of expression, in any case, is an important right, and to be banned from a community only appropriate for the most serious occasions. I don't know if he is innocent or not but I am sure a week of EF detox would do him good. I have him marked as one of the pathetic frequent posters who would go digging through someone's old posts in the high school mean girls style. Also, MusicChick is cool. If she banned him, she must have good reasons. Last edited by Kedi; 17.04.2019 at 12:18. Jag seems to be more the type to go digging through obscure electronics websites looking for a poster's non-standard light-fitting/window catch/cooker knob to help them to fix it than trawling through their posting history. But that's just my observation. Since I have no clue what the reason for the ban was I have no opinion about it being fair or not. Christ... Jagwaugh did not go the trawling, Musicchick did. It's like the high school clique scene from any high school movie in here. Her reason, as far as I can tell, was hurt feelings and because she could. Funny that Ace1 closed the conversation about Ace1 thread. Are mods allowed alts now? Get JW unbanned, this is a farce. Specially as it had taken a new turn, asking whether the other mods should publicly voice their opinion about MC's decision/action. Which I think they should not. It's the team/boss/parent situation: They should stand together. They can discuss it, my boss might ask/convince me to handle the matter differently in the future, my OH and I may agree to handle the matter differently with the kids in the future but what has been decided stands. As a team they are handling this well, me thinks. It's a bunch of volunteers - it was good it was discussed, they got input. But if they don't hold eachother's backs - to the public at least - they're stuffed. Hahaha. In all fairness, the thread hadn't been about him for about 10 pages, after we collectively proved Loz was in the wrong.